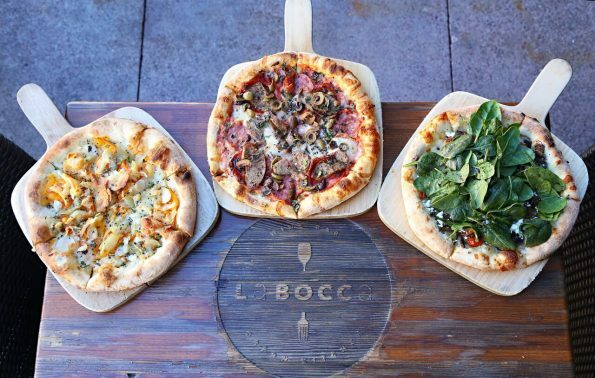 La Bocca Urban Kitchen + Wine Bar, which is located at 5415 East High Street on High Street in Northeast Phoenix, is now offering a “Date Night” dinner package! Now available every Thursday, the Prix Fixe menu includes a select bottle of red or white wine, a full bruschetta board, one chef’s pizza to share and a dessert for just $39 per couple. Reservations are not required but strongly recommended. For more information, please call (480) 840-1799 or visit www.laboccapizzeria.com. La Bocca Urban Kitchen + Wine Bar on High Street brings together everyone’s all-time favorite Mediterranean and Italian ingredients. Offerings range from fresh basil and creamy hummus to savory bruschetta boards and made-from-scratch pizzas. In addition to the food, La Bocca boasts custom handcrafted cocktails by mixology mega-stars JT Tillman and Kyle Mason, custom wine flights, dozens of whiskeys and several wines from across the globe available in tastes, glasses or full bottles. La Bocca is owned by Mill Avenue Management Group, which brings more than 40 combined years of experience in the restaurant, nightlife and event industries to the exploding culinary scene in Arizona, and has sister locations on Mill Avenue in Tempe and in the heart of Downtown Chandler. Its ingredients for success are simple: take a healthy dose of classic hospitality and sprinkle with equal parts innovation and inspiration. For more information, please visit www.laboccapizzeria.com.